Here's another antique photo cards. 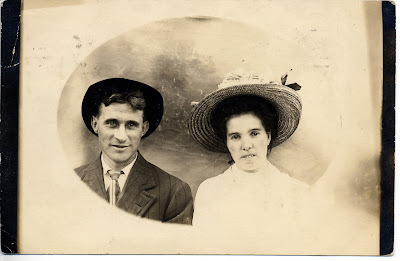 These cards are real black and white photos, made into postcards and mailed. Rarely are the people's names on the cards. Sometimes the people are strange. Here's today's Friday Freebie. Feel free to leave a comment with your caption for these interesting folks. 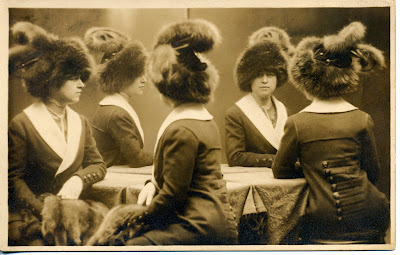 Never to be married, Agnes and her four sisters, Ethyl, Eunice, Henrietta, and Olga, were known about town as the Crazy Cat Hat Ladies. Should we even admit it? Do we dare? We like pink wine. No, don't get scared, this is not your mother's White Zinfandel. Nor is it like the wine coolers you drank before you were of legal age. We have sampled (read: consumed) two varietals of pink wines this season. 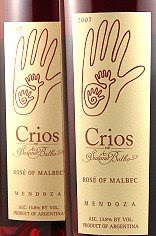 The first is Crios Rose of Malbec, from Argentina. Yes, it is made with the same grapes of a traditional Malbec. The processing (with or without the grape skins) account for the color of the wine. I found the wine to be pleasantly tart and have a nice, dry finish. Robert Parker, Jr. gave the wine 89 points and said, "The 2007 Rose of Malbec is medium pink with an expressive bouquet of strawberry and cherry. The wine is medium-bodied with lots of glycerin giving the wine a smooth palate feel. Dry in style, the wine has rich flavors, excellent acidity, and a lengthy finish. Drink this remarkably food-friendly wine over the next 1 - 2 years. All of the Crios wines are outstanding values"
The second pink wine we tried was Nine Vines Rose made up of a Grenache and Shiraz blend. Again, this wine utilizes grapes traditionally used to make red wines. Again, this is a light, tart, dry wine. The Wine Spectator gave the wine 89 points and said, "This wine has raspberry and strawberry aromas on the nose. On the palate, zesty fruit flavors of red currant and raspberry from the Grenache combine with spicy cherry of the Shiraz to produce a crisp, refreshing wine with a long, full finish." 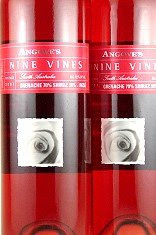 The Nine Vines Shiraz Viognier, a red, is another interesting blend and quite a tasty combination of grape varietals. It's a nice, lighter red that will be great to enjoy all summer long. So, if you are looking for a new wine to try, be adventurous. Go pink--you might be surprised with what you find. Be not too hard, nor too feeble. Oh! We were tagged to play a game. Takes me back to elementary school, you know, when they picked teams for Kick Ball, or Red Rover. Sadly, I wasn't very coordinated, and was always picked last! Good thing coordination or kick ball skills didn't count in college. So, last week we were tagged by the Lovely Kat. She is quite a great lady and sent us this great package a few months ago. Nice to have a friend in Canada. I love dishes! I love to collect, look at, and write about all types of dishes. Big ones, small ones, useful ones, and decorative ones. The problem with this collection is that it takes up lots of space. I obsess about the details. I want to have each element of what I do relate to a "big picture." When I give a party with a buffet, I make menu cards for all the foods, I will even make a coordinating drink menu if we're serving drinks. Obsessive, maybe a little. I dislike exercise. You get hot. You get sweaty. It takes a lot of time, not just the time to exercise, but shower and dress afterward. I do it anyway. I am not a big fan of candy. On my list of dislikes: Necco Wafers, licorice (all types), jelly beans, taffy, cotton candy. My weakness is chips and salsa, or cheese and crackers. Give me some fine Camembert and baguette any day. (that's why I have to do #3). I am nonathletic and uncoordinated. That's why I always got picked last for the Kick Ball team. That's a bit about me (Rachel). What about you? In my mom's massive collection of vintage postcards are a number of antique photo cards. 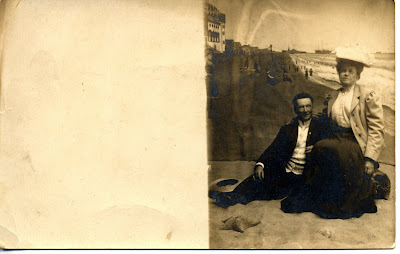 These cards are real black and white photos, made into postcards and mailed. Rarely are the people's names on the cards. Sometimes the people are strange. For today's Friday Freebie, I have two lovely couples to share with you. Feel free to leave a comment with your caption for these interesting folks. (This is a fun game to play, Amy calls it Fantasy Family.) If you like these ones, who knows, maybe we'll put up some more. Technical Help Question: Does anyone know why sometimes when you load a photo into a blog the reader can click on it to see it as a larger image, and sometimes the reader can't? I would like the photos to be accessible in that way, however I am about 50-50. Any ideas would be greatly appreciated. Two of my friends have had babies recently. I decided to try my hand at making baby blankets for their wee-ones. I have been drooling over the super-soft polka-dot fleece at the fabric stores for quite some time, but had no reason to buy pastel blue, pink or yellow for myself. So now the occasion arises. Having never made a baby blanket, it was a learning experience. My concept was simple. One side of the blanket would be a super soft fleece, the other a cute cotton print, all bound together with one of those satin blanket bindings. First I borrowed one of my daughter's blankets to figure out what size. After washing the material, I cut the two pieces to the appropriate size. 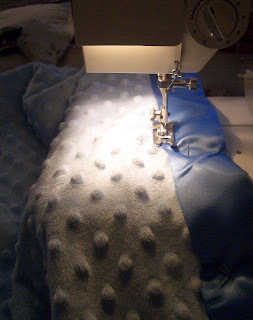 Cutting the fleece was an exercise in fuzz-making. Then I pinned the two blanket sides, right sides together and went to the sewing machine to stitch...and realized, I needed to pin them with the right sides facing out. So, I un-pinned an re-pinned the blanket--did I mention, I don't like to pin. 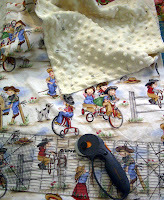 Next tip, stitch so the cotton is on the feed-dogs, not the fleece, that will help avoid the bunching. 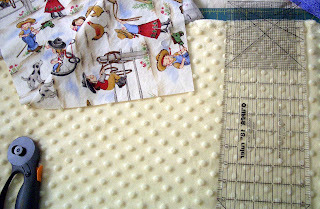 After the two pieces were stitched together, pin (again) the satin binding on the edge of the blanket. Working one side at a time, I attached the binding and mitered the corners. Again, the stitching worked better with the cotton side down. With one blanket done, the second one was a breeze! Wow! Two blankets done in one day! What do you think? 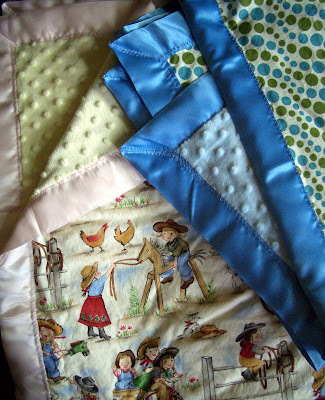 I will put them in the mail, and hopefully my friends and their babies will be happy with their new cuddly blankets. It's me, Blue. I am back at the big old blue house. Do you remember me from before? I wrote blogs here and here. My people went away again and left me with Rachel. It's not so bad. Let me tell you about my time. We spent all day Monday in the studio. Rachel said she had lots of work. I wanted to walk, but Rachel said all the orders came in since Kerry went on vacation, something about Murphy's Law, whatever that is. I had an important job. 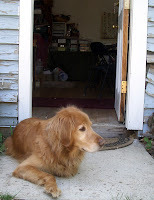 I guard the door. My job is to make sure no squirrels come in. First, I look left. Then, I look right. 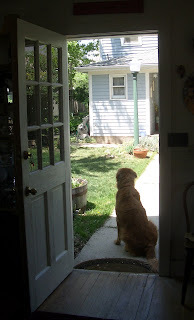 Then I might even get up and chase one of those wily squirrels. That's the fun part. After a while, being the guard got boring. 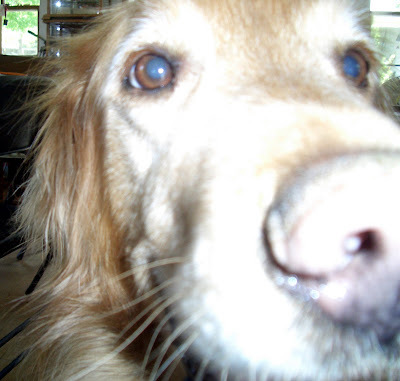 So I went into the studio to see what I could sniff. hmmmm, no snacks out there. I did borrow the camera and took a self-portrait. (Don't tell Rachel) What do you think? Do I have a future as a photographer? Well, enough writing, this is hard work. Now it's time to take a nap before those little girls come home and want to play. Talk with you later. Regular readers, as you know we love cheese! Luckily for us, there is a fabulous place here in Longmont, Colorado called The Cheese Importers. They import cheese from all over the world. You have never seen so much cheese before. It is a truly magical place for food lovers and we thought we would take you on a tour. When you first go into the shop, there is a beautiful gift shop with all sorts of crackers, candies, dishes and paper goods. After filling your basket with all the goodies you find out here, then it is time to shop for cheese. The cheese portion of the shop is in a giant cold storage room. You need to wear one of the lovely cheese jackets provided for you. As you can see in the picture below, I am modeling one of them for you. Doesn't it make me look like I have a tiny head? Here is the French cheese section. There were at least 15 different kinds of brie alone. YUM! Here I am marveling at the Spanish cheeses. There is a fabulous Spanish cheese called Drunken Goat. It is a goat cheese infused with wine, it not only looks lovely but tastes fabulous with a very distinct wine flavor. Did we mention the olive bar? I sampled a wonderful feta stuffed olive. I don't know as much about olives except that I cold eat a whole bowl of them. Rachel was fascinated with this next cheese. It was the most expensive cheese in the store at $29.99 a pound. Too bad we weren't rich enough to try it. If any of you out there have had the truffle cheese please let us know if it is worth the cost. The Cheese Importers is a great little day trip for us. Luckily it is just far enough away from our houses that we can't get over there too often. But, there are rumors that they are opening a second location walking distance from Rachel's house. So, you'll know when they open because Rachel and I will gain 30 pounds and walk around in a cheese induced stupor. We count on our blog friends to pose an intervention if this happens! Don't let us become cheeseaholics! I have said before that coffee is a beautiful thing. It is one of my weaknesses, (as are wine and cheese). Yesterday I happened upon the most beautiful coffee I have ever seen. This masterpiece was created at Fluid Coffee Bar in Denver. I was struck with how art was infused into their shop and into their art. 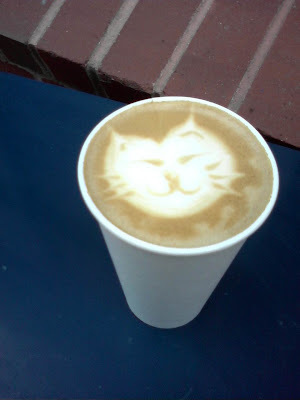 Without being overbearing, they have touches of art throughout their space; and without making a big deal about it, the barista presented me with this little piece of Latte art. They are truly promoting artful living. you may pass them again as you fall. ... a picture can say "I love you" over and over again. 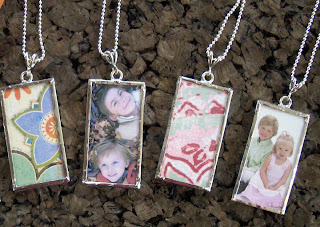 Several of our friends had Kerry and I make these photo pendants for their mothers or friends for Mother's Day. We hope they enjoyed them. It was fun working with these cute kids pics and the wonderful handmade paper collection we have in the studio. 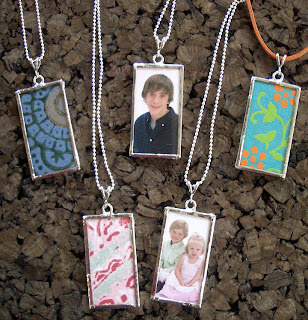 Each person choose their favorite paper to complement the child's photo and the wearer's sense of style. We hope the recipients enjoyed their gifts last weekend as much as we enjoyed making them. 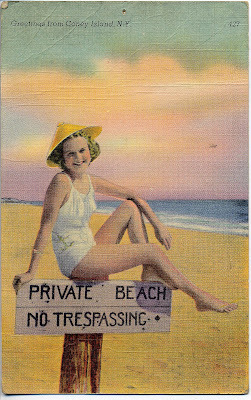 The above image is from an old, undated, unmarked greeting card. 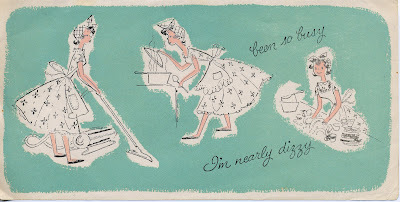 Surely we all do the cleaning and cooking in such a lovely frock as this one. Be sure to thank your mom for all she does! 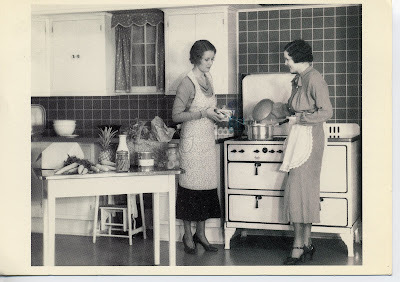 Ethel- Oh, Myrtle, I don't know...just how long have these turnips been in the Frigidaire? Myrtle- Throw them in anyway, no one will notice. Cook anything for five hours and it doesn't taste like much. I took this pattern from the Sew Simple Book I told you about earlier last week. I thought the pattern was simple enough, make a pieced piece of material using tapered strips of material. The trick for me was to alternate the wide an narrow ends of the strips. I think that I goofed it up several times, but you might not notice if I didn't point it out. I used a color palette that matches her kitchen colors, a bright blue and yellow. I thew in the green to add some 'pop' to the design. I had fun mixing the colors and large and small patterns to create visual texture. I found heat-proof batting to use inside the pot holders, and added a loop of ribbon for hanging. I made the towel top so that it can be hung from a convenient spot in the kitchen. All I have left to do is add a button to keep the towel attached. The book suggests that the same idea could be used to make coasters as well. Upon reading that idea, my head started spinning to all sorts of other ideas to use this construction: table runners, place mats, even the front of a tote bag. The possibilities are obviously endless. 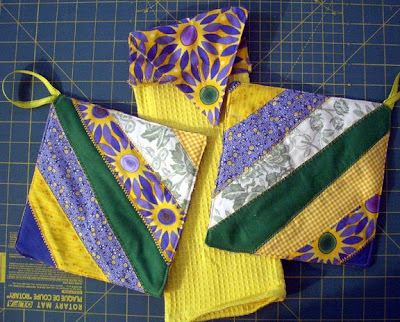 I was so excited about the design, that I started piecing more material to make a set for my grandmother. Unfortunately, this set is yet unfinished because I was consumed with making 8 Lullaby League skirts for the Wizard of Oz at the elementary school and the fabulous photo pendants that Kerry and I made for several customers this week. I will show you those next week--I don't want to spoil anyone's Mother's Day surprise! At Casa Bonita, you always get free sopapillas at the the end of your meal. Sopapillas are flaky dough puffs that are hollow inside and supposed to be eaten with honey. They are actually quite good but then again we are on a diet (sigh.) Claire decides to teach the kids a new way to eat them. Bite off one corner, then fill the hollow dough with honey (filled to the brim.) Take a bite and watch honey roll down your arm. Of what sticky fun! After we unstick the children from the table we head to Black Bart's Cave. I head in with Molly, Mary and Claire (Lauren, the oldest of the bunch, wants nothing to do with it.) Apparently I move too quickly in the cave and cause things to buzz at us and can't manage in the narrow passageways with 3 children attached to me and the kids leave me! They go backwards through the cave not wanting to hear any encouraging words I may have. Later they all go in with Rachel and have no problems and nothing buzzes at them or pops out. Our friend is also easily amused by gorillas and we think she may have been getting free margaritas as she kept wandering "backstage." Alas we had had all of the fun we could at Casa Bonita and it was time to head home. But there is one last amusement to behold on our trek. In a little strip mall, we pass a strange sight. A Casket store named "Casket Mart" next door to a sausage factory! Are Mrs. Lovett and Mr. Todd the proprietors??? Are their "meat pies" beyond description? Do we even want to know the secret ingredient? So, come visit Colorado, there is much more here than beautiful mountains and skiing. Take one of Rachel and Kerry's lovely tours to see the "real" backcountry. One of our favorite places in Colorado is Casa Bonita! A Restaurant and entertainment destination all wrapped up in a pink castle! It was once featured in an episode of South Park. The food is beyond horrible, the atmosphere is reminiscent of the Twilight Zone but it is guaranteed to give you a laugh. So once a year Rachel and I pile all four kids into the mini-van for the half-hour trip to Casa Bonita. This is our 4th year and the children are only beginning to groan a little. We don't know why this became an annual tradition but it has, groaning children or not! Please join us as we take you through Casa Bonita pictorial tour 2008. Yes, it really is a pink castle. Strategically placed across the street from a wide assortment of pawn shops and tattoo parlors, adding to the general ambiance. The neon sign inside the restaurant says it all when it comes to the fine cuisine offered here. After waiting in a winding amuzement park like line to order your food, you then proceed to the mystery holes. Yes, your food does magically appear through these holes. Next take your colorful tray with food into the seating area. We were lucky enough to be seated by the Las Sopaipillas factory. We even had a good view of the gorilla show. Another great view of the beauty seen from our seat. The interior of the restaurant is filled with lights, palm trees and a waterfall with cliff divers. Ahhh! the gorilla show. Who knew he would break free from his chains and run around the restaurant with uncontrollable toddlers chasing after him? Hilarity ensued, look he even has pants! A gorilla in swimtrunks, where else will you see this? Our picture tour will continue tomorrow but until then here are some burning questions to keep you on the edge of your seat. Will Rachel and Kerry make it through lunch since they are still on a diet? This means no tortilla chips or margaritas, IS IT POSSIBLE? Will the children make it through the terrifying Black Bart's Cave or will little Molly be lost forever? Will we buy the light up bunny ears from the wandering saleslady? Will the Saleslady ever stop laughing at the gorilla show? How could she not know what will happen next? He's wearing swim trunks, FORESHAWDOWING - somebody is getting pushed into the water!!!!! Tune in tomorrow for the stunning conclusion, Casa Bonita's Revenge or Get me a Margarita or Die! 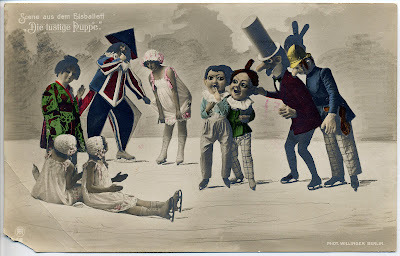 Another wacky vintage postcard. What are they doing?!? We have both been looking for some new things to make. We are always looking for new designs, new patterns, fun colors, and pretty fabrics. We found this latest one in the book Sew Simple. This book is filled with lots of simple, yet cute patterns for everyday living. There are easy home decor patterns as well as patterns for accessories and gifts. I think what I like best about the book is that the patterns are easy to follow, but the final product doesn't necessarily look too simple. 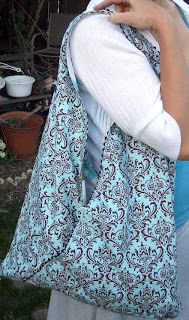 The first pattern I made was the Sling Bag, which is pictured on the back cover of the book. The bag was not too difficult to make, although I had to re-read the directions several times to make sure I understood the construction of the bag. I have become so used to tote bag construction. It is very similar to a Martha Stewart pattern that you can find on her website. 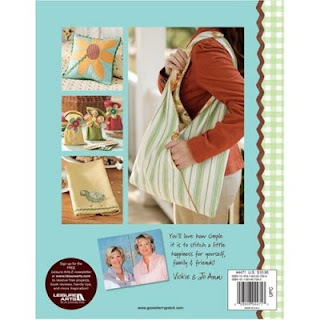 Martha's bag is a simple and functional, unlined bag using a pillow case. 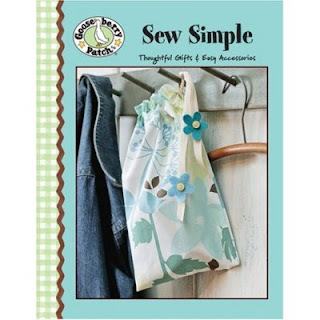 The Sew Simple bag is trimmed, lined and complete with pockets. I chose a pretty aqua and brown fabric for the outside of my bag, and a summery white with aqua and brown flowers as a lining material. The two complement each other nicely. I followed the instructions for using ric-rac as a trim. Chocolate brown ric-rac seemed to make a nice accent. Instead of using fabric covered buttons, I found some painted ones in coordinating colors and fun designs. The bag is quite a bit bigger than I would use for a purse. But I would use it as a tote or market bag. I may try to scale the next one I make down a bit and add an interior snap, for every day use. My next project will be the striped pot holders. I will let you know how those turn out, too. 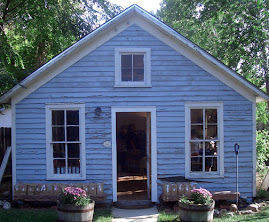 I guess I do still make things, I just haven't blogged about it in a while.